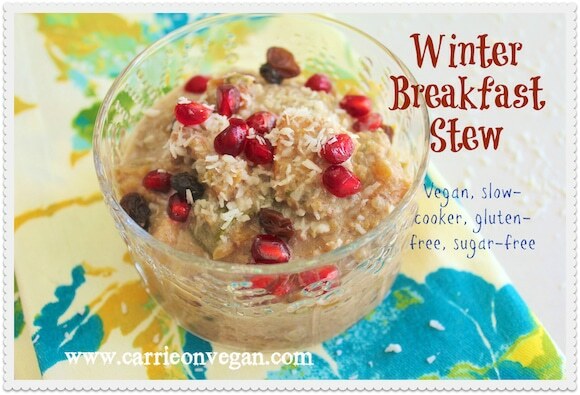 This Slow-Cooker Vegan Winter Breakfast Stew is a delicious way to warm up on a cold morning. It’s gluten-free and sugar-free. Baby, it’s cold outside! Cold weather means no more green smoothies for awhile, at least not in the mornings. I was inspired recently by some of the cooked breakfast recipes and try making a sweet breakfast stew instead. I had a bag of cranberries leftover from Thanksgiving that I used in my recipe, but you could substitute frozen wild blueberries instead. I love that this stew still allows me to get in a serving of vegetables in the morning, but the best part is how the sweetness of the butternut squash and the fruit melds together with the veggies into a gently sweet, filling, and warming meal. A warming breakfast for cold mornings. Full of nutrition and flavor. Place the cubed butternut squash in a 6-quart slow-cooker. Chop the zucchini, persimmon, and apple into bite-sized pieces and add to the pot. 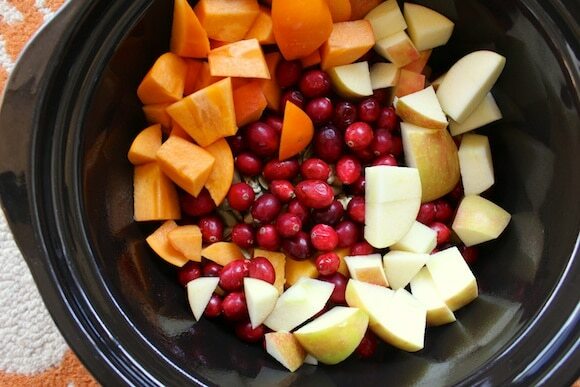 Add the cranberries or blueberries, walnuts, and pumpkin seeds to the pot. Add the pumpkin pie spice, vanilla extract, raisins, chopped apricots, uncooked quinoa, and baby kale to the pot and stir to combine. Pour the almond milk over the contents. 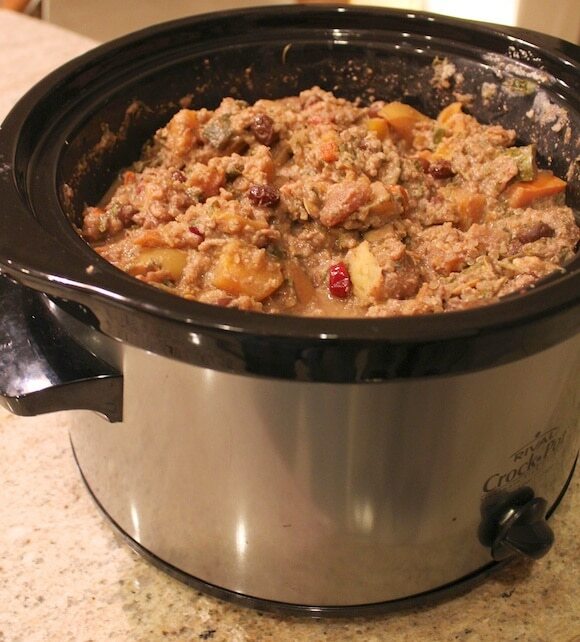 Place the lid on the slow-cooker and cook for 12 hours on low heat or 6 hours on high heat. 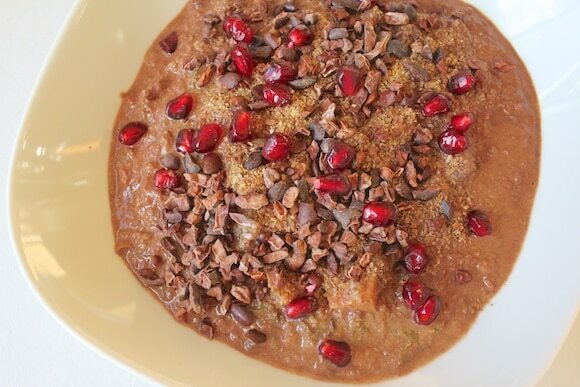 Serve hot with a splash of almond milk, non-dairy yogurt, and topped with cacao nibs or fresh pomegranate arils, if desired. Freeze any leftovers. Note: if you prefer to cook this recipe on the stovetop, I would recommend bringing all of the ingredients to a boil, and simmering for 45 minutes to an hour, or until the butternut squash is tender. Jeez, after my Pumpkin Breakfast Brownies and Sweet Potato Pudding, I’m getting good at this veggies for breakfast thing, eh? Enjoy!!! Wow – this looks gorgeous and sounds so delicious!! I don’t have a slow cooker so I am going to try and make it over the stove top and see how it turns out. Thanks, Kimmy! Do let me know how the stovetop version turns out. I don’t think it will be as mushy as mine turned out, but I liked it that way because then the veggies weren’t so evident. You could always use a hand immersion blender to get a creamy texture once your stove-top version is done cooking. Have a great weekend!!! Is your new pup able to go on runs or hikes with you? Had this for breakfast today. Subbed a large sweet potato for the squash, steel cut oats for the quinoa, & some dates for part of the raisins; also added ginger & a hit of cayenne to the spices. Really enjoyed it, but probably ate too much; I too struggle with portion control. Very unique idea & great cold morning breakfast! BTW, I liked all the textures; think it would be a shame to use an immersion blender. I served mine with chopped kiwi & my own silken tofu faux yogurt. Nope, served it hot from the pot & usually reheat a serving size 🙂 of porridge in a bowl at low heat(about 200/225F) in the oven while I’m putzing about in the kitchen in the morning. I really love the idea for getting greens into the porridge on non smoothie days. This looks incredible! So many of my favorite foods in one meal! I can’t want to try this. I found this on Pinterest and I really want to make it for our Christmas morning. My family of 5 went vegetarian after the holidays last year and we usually have a sausage casserole type breakfast so I needed a substitute for that. 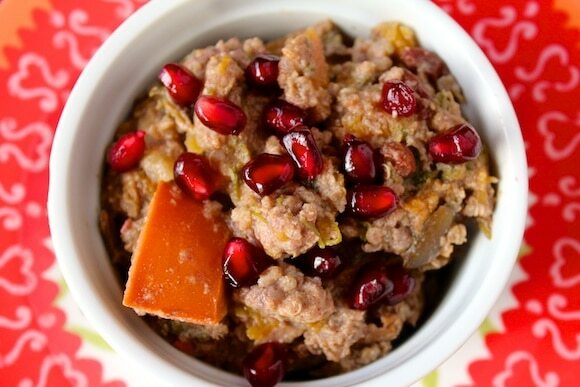 Would you say this recipe is more savory, or sweet? Thank you, Ricki!!! Sending you all the best for a great 2014. I just made this for the second time last night (after finishing the batch I made just last week). I LOVE it! The first time I made it, my hubby and I ate it all before we could freeze any so this time I doubled the recipe and am freezing half of it. The first time I had it, I ate it with goji berries and cocoa nibs, but the second time I added cocoa powder/cacao powder and stevia… WOW. I’m obsessed 🙂 Sharing on my Facebook page tomorrow. 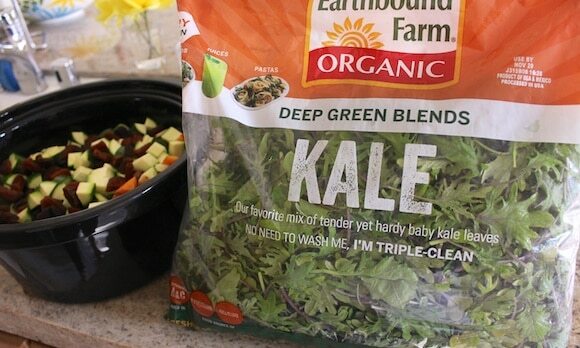 It is such a creative recipe and incredibly nutrient-dense. I also love that it keeps me full much longer than other breakfasts. I noticed that I like it better when it’s thicker so I run the crockpot on high to make it more of a chili-like constancy. I subbed what I could find in the stores near me: frozen blueberries instead of cranberries, apple instead of persimmon, dates instead of raisins, and steel cut oats instead of quinoa. Thank you for an awesome recipe! Mine didn’t look anything like yours, was quite runny (maybe need more quinoa?) and very “brown”. But the taste was good. I’m thinking a mixture of quinoa and oats might work better. Or less almond milk? I really like it though and will play around with the recipe. YAY, for winter breakfast stews. I just can’t eat cold foods first thing in the morning, especially winter time. More people should be turning their crockpot on in the winter. SO creative!! I would have never have thought to combine ingredients like this for a breakfast stew! So many good for you ingredients and endless ways to adapt and make it your own, awesome Carrie! 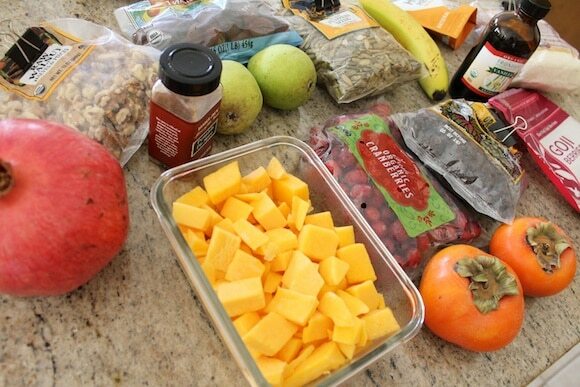 Look at all those gorgeous ingredients!! What a fun breakfast! Yum! 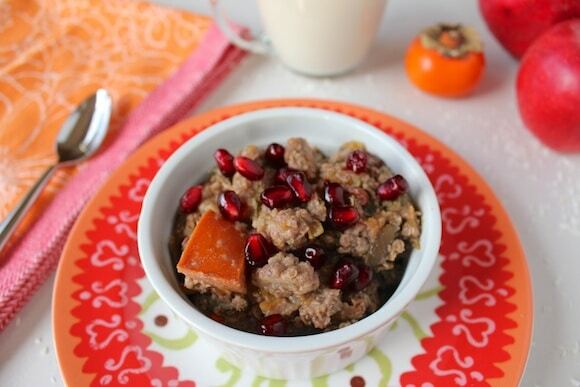 The minute I see persimmons at my grocery store, I’m making this! 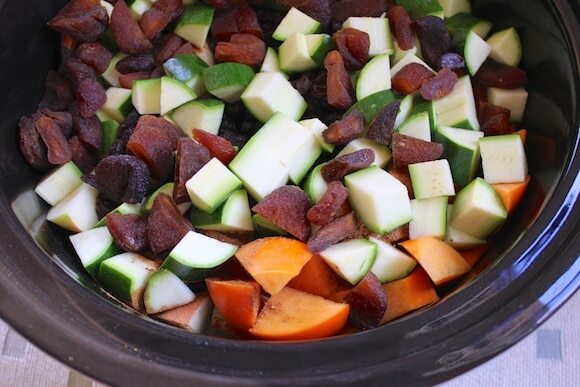 I love that you can make this in the slow cooker! Looks so comforting and cozy on a chilly morning. 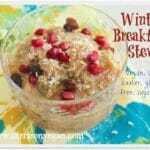 I never thought of a breakfast stew before, but what a great idea when you are tired of the same ol same ol. I love the idea that is is so warm and comforting for those cold mornings. Perfect with a mug of green tea! What an interesting recipe! I’ve never thought to make a brekky stew like this! This is a really lovely idea! I would have never thought of something like this. It seems so hearty and full of delicious flavors. Wow! What a nice way to mix up breakfasts! My family was just asking for alternatives to eggs for breakfast! Wow! I am impressed. 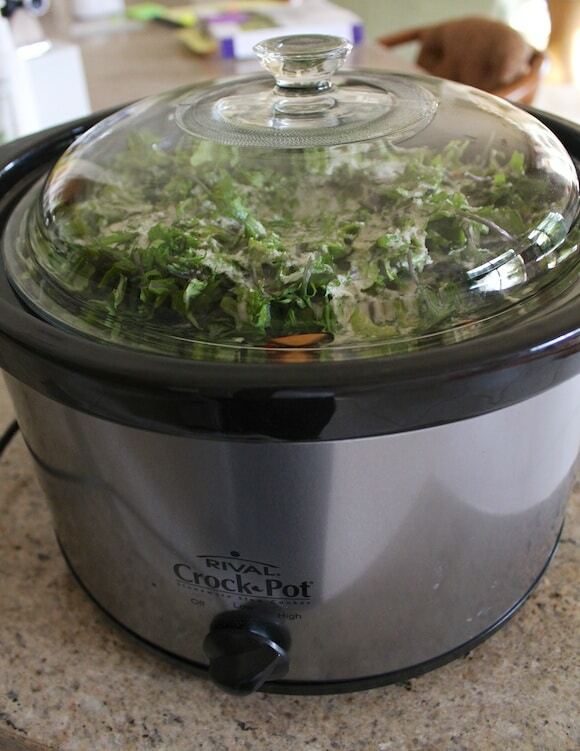 I love making meals from my slow cooker and this is perfect for the weekend. I have persimmons in my freezer right now that I bet would work well. I was just thinking that I needed to decide how to use them soon. I would have never thought to make breakfast this way! This is such a life savor as I never have time in the morning! Oooh, this look so cozy and comforting. And I’m so impressed with how much nutrition you’ve packed into this recipe! 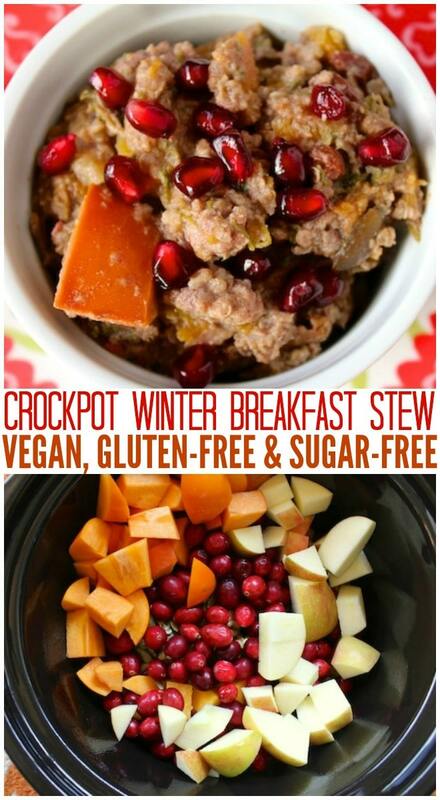 This is such a cool idea – I’d never thought to make a sweet stew for breakfast in a slow cooker! What a hearty healthy breakfast to start your day! So much goodness it one bowl!